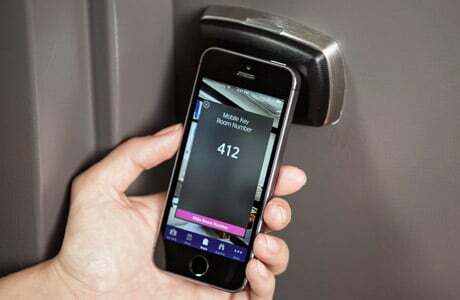 Starwood Hotels & Resorts Worldwide has unveiled a mobile keyless entry system that will allow guests to use smartphones to unlock rooms using Bluetooth at 150 hotels around the globe by early 2015. The service will also be available via an Apple Watch app when the new wearable device ships next year, the hotel chain has told NFC World+. SPG Keyless will go live in ten locations in Beijing, Hong Kong, New York, Los Angeles and Doha on November 5 and will be available to members of the Starwood Preferred Guest (SPG) loyalty program at Aloft, Element and W hotels. “SPG Keyless is available to SPG members who book a hotel room through one of Starwood’s channels,” the hotel chain explains. “SPG members must register their phone once through the SPG app and allow push notifications. “After booking a reservation at a keyless hotel and approximately 24 hours before arrival, SPG members are invited to opt in to SPG Keyless. Guests will receive a push notification noting that they are checked in and the SPG app will update with his/her room number and Bluetooth key when the room is ready. “When Apple Watch is available next year, we envision endless ways Apple Watch could help us enhance our guests’ experiences at our hotels from instantly recognizing guests with a warm, personal welcome to empowering our SPG members to bypass the front desk,” Starwood told NFC World+. “When you arrive at a destination airport, a notification will take you to a list of transportation options to your hotel. When you arrive at the hotel, a notification shows you your room number with instructions for using Apple Watch to unlock your room and when you arrive at the bar, you’ll be asked via notification if you’d like your usual drink brought to your table.